I got home from the BlogHer Food Conference last night. All I can say right now is, wow! My mind and heart are still full. I am honored and grateful to be a part of such a powerful, talented, and inspirational community. I haven’t had time to even unpack yet, so pictures and details will have to come later. 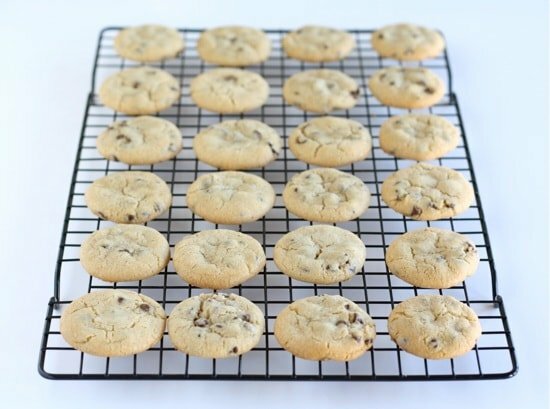 Instead, I am sharing my mini chocolate chip cookie recipe today. I love mini desserts. They are adorable. I have made mini cupcakes, tarts, and breads, but surprisingly, not cookies. I don’t know why because you all know I have a cookie obsession. I recently made a batch of mini chocolate chip cookies that were almost too cute to eat. I used mini chocolate chips and made the cookies really small, about two teaspoons of dough per cookie. The cookies were perfectly round and tiny. When Josh saw the cookies he thought I bought them from the store. 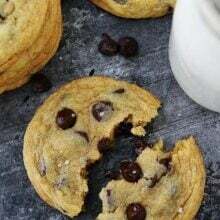 Um, no-I don’t buy my cookies, I bake them:) These mini chocolate chip cookies are soft, with a chewy edge. 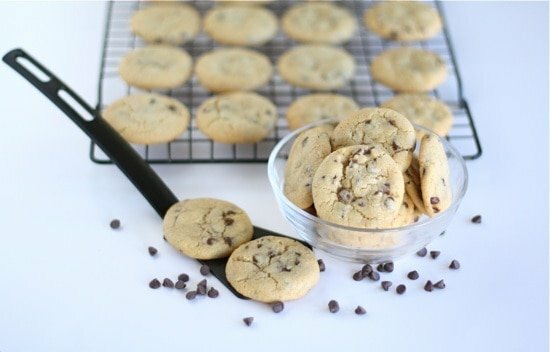 Mini chocolate chips are the perfect size for these itty bitty cookies. 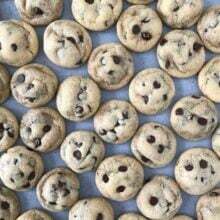 If you like mini desserts, try baking a batch of mini chocolate chip cookies. They are perfect for kids, baby showers, or snacking. Good things come in small packages! 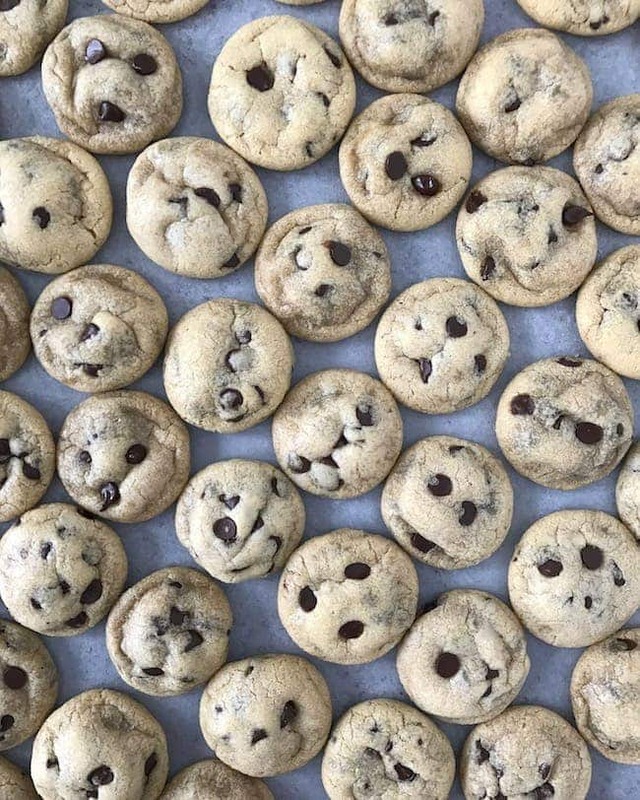 These bite size chocolate chip cookies are almost too cute to eat! Roll dough into tiny balls, about 1 1/2 teaspoons of dough. Place mini balls on baking sheet and bake for 6-8 minutes or until cookies are golden brown and set. Remove from the oven and let cool on baking sheet for two minutes. Transfer to a wire rack to cool completely. I’ll admit I am jealous about the BlogHer conference but I’m sure it was amazing!!! This mini little cookies are great!! You should try to attend next year. The conference was amazing! These look amazing. I LOVE mini cookies! These look delicious (as usual) and I love your photographs. I kept reading “mint” chocolate chip cookies and couldn’t figure out where the mint was coming from– haha! I’m excited to hear about Blog Her Food! what cute little cookies! i love mini desserts! You have the best ideas! I love mini desserts and these look so yummy. I can’t wait to hear about Blogher Food. I would LOVE to go. Can’t wait to read about the conference!! These little cookies are so tiny and cute! I love it!! these look like so much fun. This is a perfect recipe for a Monday – thank you! Ah I love mini desserts. These are adorable. Plus I love the really short cooking time. I can’t wait to hear about BlogHer Food….wish I would have been able to go. Oh, I love these! They remind me of the ones my mom used to buy at the bakery. I can’t wait to try them! I think everything tastes better in mini form…especially cookies! These look delicious. Such cute cookies! And I can’t wait to hear all about BlogHer! Those are too cute for words! Definately bookmarking this one! I love the idea of baking mini cookies! They are so cute and bite-size! Great to see you, Maria and hope it will happen again soon! Love mini anything, especially chocolate chip cookies. Yours look great. YOu are such a good baker! And thanks so much for the link shout out above-that was so nice of you. I love making Mini Cookies, for some reason they taste better mini then maxi! these look almost too perfect to be homemade. they remind me(in looks only) of the junk I grew up on that came in that horrible white and pink, glossy bag. I can tell by your ingredients that these are above and beyond what I ate as a kid. I loved hanging out with you this weekend. What a special time for us all! Friends for life! Friends for life indeed! Love and miss you! Those cookies are perfect!! Do you use a scoop? Yummy!! I used a little spoon. Love minis! And LOVE, LOVE ccc’s. Glad you had a great time at BlogHer. Can’t wait to hear more about it. These are absolutely adorable!! I love how mini they are and that they are still soft and chewy. Will definitely need to try these! Glad that you enjoyed your conference! These cookies are so cute. I’ll have no problem eating a handful…or two. Will have to try sometime as I’ve never made mini cookies yet. These are the perfect size for my boys’ lunch boxes and after-school treats. Oh, oh I love mini desserts! These are adorable. I have a chocolate chip cookie recipe I always use, but I think I’m going to try yours next time. Haha, I’m the same way about not buying cookies. Why should I when homemade taste a million times better? Those are adorable!! Cute little cookies – I’ll have to try these this weekend. The conference sounds amazing – look forward to reading more about it. awe these look so cute! I am glad you had fun at the conference. The mini cookies look perfectly delicious. Very cute! Your cookies look sooo perfect… Just love them. I made these today for a friend. They were perfect! Thanks for sharing. Janelle-glad you enjoyed the cookies! Love the small chocolate chip cookie! Just means I can eat more 🙂 These look cute and delicious. My kids will love these! Glad you had a great trip! Those are so adorable. I have a love for all things mini… especially desserts. And these are so cute! Beautiful cookies!! A fabulous treat ! These look so yummy and super cute Maria! So glad we got to meet and chat at BlogHer Food this weekend. You are fabulous! So stinkin’ cute these cookies are! Well one good thing about him mistaking them as store bought is that they must have been a visual perfection. I love mini chocolate chips-they are so cute! I love small cookies, perfect size! These are SO cute!! Seriously, I am making them as soon as I buy miniature chocolate chips! LOVE! I can’t wait to hear more about BlogHer Food! Love you my beautiful friend! Those are adorable! I can’t believe I’ve never made mini cookies before either! These would make great gifts tucked in a cute container. I used your recipe, but I substituted in baking powder (didn’t have any baking soda) and I substituted 1/2 cup of old fashioned oats for some of the flour. I also found I had to cook them about 10-12 minutes to get the edges to crisp. They are very very yummy though, so thanks! these look delicious…like the Entenmann’s ones! You’re right. They are too cute to eat. You’d better give them to me, I’ll get rid of them for you! Yummy! I can’t wait to try this one. Maybe adding some chocolate syrup or some cream cheese icing will make it yummier! This is so indulging! I should better make some of this later and eat some for our mid night snacks while we are watching televisions. My kids will surely love this with their glass of fresh hot milk. What about making mini ice cream sandwiches with these? I might just have to try it. I made these cookies tonight for my coworker’s birthday tomorrow. I doubled the recipe and made a bunch for ourselves. After 50-some cookies, I still have dough left so I put it in the freezer for the rainy days. These cookies are So Awesome!!! I love it. Thanks for sharing this recipe. Any tips on how to get frozen butter up to room temp quickly? You can slowly defrost it in the microwave, just watch it carefully! Cookies looked good but very bland, I just baked a batch. A little disappointed, can’t tell almost what you are eating…….sorry, but everyone was commenting on how cute they were but not the taste. I just made this recipe yesterday and they turned out AMAZING. My friends and family loved them, and i will most definitely be making them again! Thank you! Glad you liked the mini cookies. I love those cute little cookies. The absolute best chocolate chip cookies ever, they were soft and not too small. I wanted a simple recipe for my 9 year old to make for a school project, and I was pleasantly surprised at how good they were. I shared the website and recipe with all my girlfriends. Thank you. I’ve tried this recipe and It was delicious. even though I don’t own an oven, I just baked it on a toaster oven same heat. I even tried it with sliced almonds. ( I used regular sized chocolate chips since I ran out of mini chocolate chip). 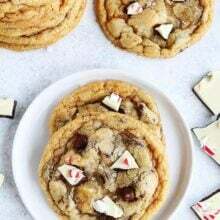 I had a recipe for these for yrs but they were always missing something I always thought it was vanilla extract so I added it to it but I was never quite sure how much to add. Well the other day I lost my whole notebook of recipes and I was so lost and trying to make a recipe from scratch when you have a disease that is slowly eating away you mind well let’s just say it isn’t fun. So Thank you for bringing back a recipe I lost and having the vanilla in it. These cookies look great! So cute and perfect for my cookie monster cupcakes! Pingback: A Little Bit at a Time « Mancktastic! They are absolutely awesome! But mine doesn’t so good as yours! What’s the secret? I’m making these today to put into goody bags for my daughter’s birthday! She turns 8 so each child will take home 8 mini-cookies in a pretty gift bag. And that is it! No junk from the dollar store, no junk food (I feel better about homemade cookies that I do a bag of random candy!). Excited to give this recipe a try! 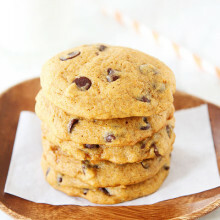 Pingback: The Sweet Basic: Mini Chocolate Chips Cookies | Mancktastic! I stumbled across this recipe while searching on the Internet for a good one. The cookies were delicious! The only thing was like other people have said, I had to bake them much longer and then broil very quickly to get them brown. These are absolutely the perfect chocolate chip cookies. I like mine crunchy, so I leave them in the oven a few minutes longer and they are absolutely amazing. These are my new go-to cookies! I can’t get enough! how long can I keep these cookies for after baking them? Store in an airtight container for up to 3 days. You can also freeze them! Hi! I really wanna make these for a birthday present for a friend, I was wondering if you recommend dark or light brown sugar and if there’s a difference? Also does it have to be unsalted butter? Is there a difference in taste? Thank you so much! I’m really hoping to make them this week. 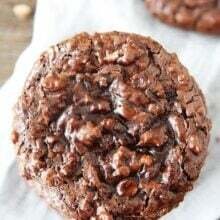 Amazing recipe for mini cookies! Just tried it for regular sized cookies and they don’t spread out – which is just fine! These cookies turned out great; they were soft and not under cooked. They made the perfect amount as well. Luv them. Glad you liked the mini cookies! I love these cookies! I made them this afternoon and will probably be making another batch or two this weekend to share at work. They are not too sweet, I mixed dark and semi-sweet chips. The only problem I had was the dough was a little crumbly at first so I added another egg and it came together perfectly. Using eggs from my own chicken it can be a little hard to gauge size so that was probably my fault. How do you keep them fresh? I’m trying the recipe this weekend!!! Keep them in an airtight container on the counter. You can also put a piece of bread in with the cookies. It will keep the cookies extra soft. Can anyone comment on how they taste? They are cute but do they taste good?? Have you tried other types of cookies as a mini version? Just wondering if bake times would follow the same for most. I think mini versions are so much cuter! Love this recipe! Always a hit, and “so cute”! These looked cute but tasted kind of bland (too flour-y) and took almost twice as long to bake as listed – and even then, they never really browned. I like the mini idea but will use a different recipe next time. Wasn’t that good had to cook it way longer than it said.